A nagging feeling about what role they should or could be doing. The methodology is simple yet effective. The following is the outline for the Full Day Workshop. Step 1. You will start by undertaking a series of pre-workshop activities including using the online diagnostic tools, that will provide initial clarity on what’s going on for you. We'll also have a 30 minute phone consultation to determine if you are ready for a career change and what 'category' you fall into. You will then participate in a Workshop (either delivered in one full day or over two half days) , designed to give further clarity on what is motivating the need for change, a strong foundation on the psychological dimensions of change and a series of dynamic and reflective activities. These activities are designed to provide you with insights on where you have been, where this could lead and the essential clues to figure out what you really want in a career. Applies this to a planning process to get you from ideas into action. This final step helps you create empowering strategies that set priorities through a personal action plan. Step 7. A follow-up one on one consultation within a month of the workshop, supports you to further work through any challenges or questions that arise. 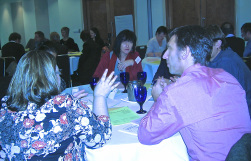 It also importantly includes a referrals process, a network of inspiring people ready to support with specific advice on side projects, starting that business or entrepreneurial idea, volunteering or retooling.This session helps keep participants on track, motivated and networking with like-minded people. 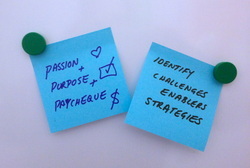 The workshop uses activity based and creative techniques, drawn from a variety of expert sources, to unlock your ideas and support participants to create a career plan that works. You’ll also be in a supportive, non-threatening environment with like-minded people. 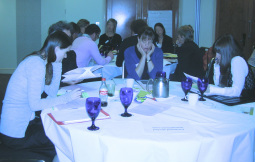 The workshop size is kept to 16 participants. If participants simply follow this method, they will not only experience the empowerment that self-awareness, clarity and focus provide, they will also enjoy the ultimate result of living a fulfilled career in their midlife. Don't waste time wondering.... invest in yourself and take the first step to action! Want to know more about Sweet Spot Services and Products? 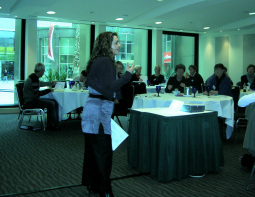 Find out when the next workshop intake is by making contact. 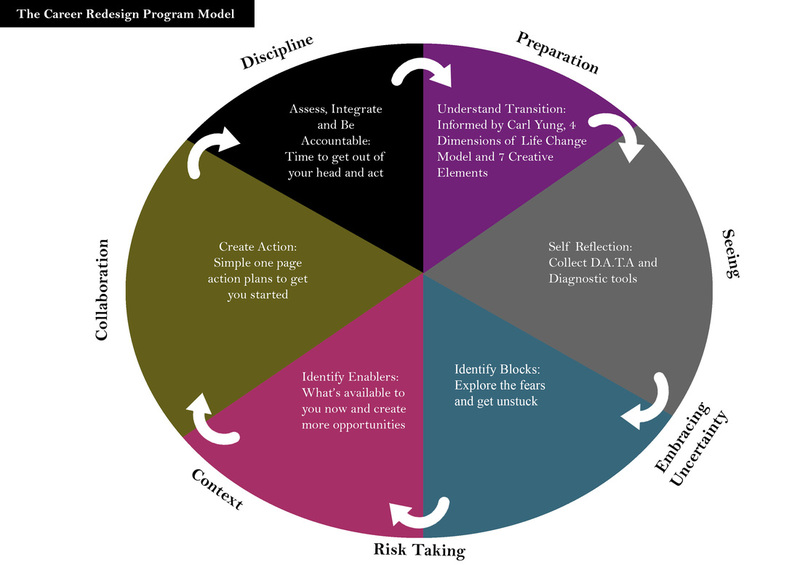 The Career Redesign Program is based on a number of principles, theories and approaches. It is built on an understanding of the psychology behind career transition and the dimensions of life change. It is informed by the thinking of experienced authors in a variety of related fields including careers, psychology, personal growth and well-being. This provides both a foundation and validity to many of the experiences and feelings participant’s may be experiencing. But all the theory in the world makes no difference if we don’t act. The program creator strongly believes we can use our innate creative skills, undertaking activities that can assist to answer our questions in a manner that helps us stay motivated. Assists to create a strategy to set priorities and create a plan to move into action. To have a career change breakthrough we need creative thinking. in your ability to succeed. Midlife transition is the bridging time between the first and second half of life with the dividing time around 40. The first half of our lives is influenced by external sources, including our parents, other adults and peers and society, while the second half is more influenced by our internal world. It 's also a time of transitions between these two halves and can be a time of insecurity and uncertainty as we navigate our way through it. Because work plays such an important role in our lives, any sense of change that we might feel could be influenced by this transition period. The way we try and navigate through this and the answers we seek to our career questions, will be influenced by past experiences, our personality, our perceived flexibility and how we approach challenges and embrace new things. Carl Yung's transition theory becomes significant when we apply this to the phases we move through in midlife. This period, referred to as ‘individuation’, assists to understand the transitional phase and where you may be at this stage of the transition. It provides another way of entering into this space and understanding the emotions and behaviours you could be experiencing. The ‘4 Dimensions of Life Change’ provides a practical way of understanding the process of change. It starts with a question/tension or dilemma phase, as we are prompted to enter a problem solving stage. This is followed by exploring and experimenting with new approaches. The exploration phase is followed by discovery as we find meaning in the exploration. We then end by integrating new ways of behaving and seeing ourselves. Understanding which dimension of life change you are in enhances your self -awareness. This understanding helps put in perspective some of the questions you could be wrestling with. You'll appreciate that some of the uncertainty and messiness of the process is both creative and normal. Experiencing these aspects of change, as uncomfortable as they may be, are a natural part of the career redesign process. The model is non judgemental and assists to frame the need for a career change as a ‘tension or dilemma’, that helps to create a period of resolution through seeking a new approach rather than staying stuck. 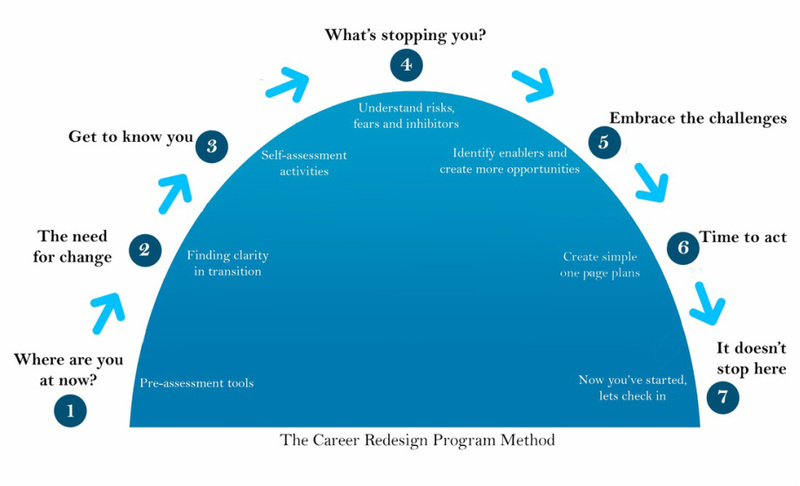 As you progress through the Career Redesign Program, you’ll see the reframing of the exploration phase through the self-reflective activities that leads to key observations that can inform your approach in the discovery phase. This is further developed as you are encouraged to dip in and experiment with roles, side projects and approaches that can all inform your transition. The focus on inhibitors assists to discover what is at the root of where you are at and its meaning in transition. Dr. Ken Robinson has written widely on creativity and how it needs to pervade our education system, as well as encouraged throughout our lives. The significance of “The Element- How finding passion changes everything” is that it not only applies to children, as adults can also recognise our need to reconnect with our creative instincts. Our need for change during midlife or mid-career, while not directly a cause and effect, can also explain the delusion or frustration we may have with our jobs and, more broadly, our careers. Dr. Robinson provides tangibility to the overall concept of ‘passion’. We know passion is a driving force that can lead us to do the things we love in both our personal and professional lives, but it’s the focus on it’s components that are most useful in this program. His next book ‘Finding Your Element’ provides a practical guide to encouraging adults to pursue their creativity further. I’m using the term ‘element’ as that place where we have found the career ‘sweet spot’, where the things you love to do and the things you are good at come together. Many of the self reflective activities in the program have been influenced by this concept and aim to offer a number of ways of entering into the space of ‘finding your element’. I also draw of Dr. Robinson’s concept of 'finding your tribe’ and connecting with people who share the same interests and passions. Connecting with people affirms that you are not alone. This matters because it validates passion and provides a place to share ideas and compare approaches. This is further extended to the value of collaboration, the ‘circles of influence’ and the opportunities for mutual inspiration this can provide. We also use terms like networking as a means to usefully engage in collaboration. I’m also very drawn to his use of the term 'the zone’ – 'to be in the zone is to be in the deep heart of the element'. The distinction being that when you are in the zone this immersive experience can be transformative. This focus, intent and the feeling of being lost in the experiences allows us to also perform at our peak. Seeking this in our careers can be a goal that we can embrace. Finding creative ways to explore this can also assist us to get there. This program also provides a number of ways to reflect on how your past can inform where your career could progress to. If you associate with “I don’t know what I want to do but I know it’s not what I’m doing now”, then you’re probably frustrated with where to start and the difficulty in breaking out of a mindset that has been many years in the making. To get yourself out of this bind and off the merry-go –round of wanting something new but thinking you only know how to do an ‘old’ role or job, we start by collecting some DATA through fun, creative and reflective activities. Together, your Desires, Abilities, Temperament and Assets give you important information to help redesign your worklife. The goal of the reflective process is to come up with 'data' that will help you find a role that is more psychologically suited to where you are in your midlife, your point of transition and what you really want now out of life.